This patient was a 28-year-old man who first noticed visual changes one year prior to presentation. Nine months prior to presentation, he stopped driving because he could no longer see well and did not feel safe. At that time, he had been drinking a half gallon or more of vodka per day for the past year. He had a 12-year history of moderate to heavy alcohol use. He noted that his vision seemed to be worse during periods when he was drinking more heavily. Six months prior to presentation, he got the flu and did not drink for two days, which led to delirium tremens and a prolonged hospitalization. It was noted at that time that his folate and vitamin B12 were low. At presentation, he had been sober for the six months since his hospitalization and thought his vision had been improving. He worked at a bar until his vision worsened. He was single and had two children. During his heavy periods of alcohol use, he would "drink" his meals. Often he would eat nothing or only one small meal per day. He also smoked approximately 1/2 pack of cigarettes per day for ten years and marijuana four times per week. As per HPI. Review of systems was otherwise negative. He denied any numbness or tingling in his hands and feet. He denied any difficulty walking or problems with his memory. Figure 1. Color Fundus Photography, OU. Both optic nerves had temporal pallor. There was a normal macular sheen with faint RPE changes OU. OS: Central scotoma to the I4e isopter. Figure 3. 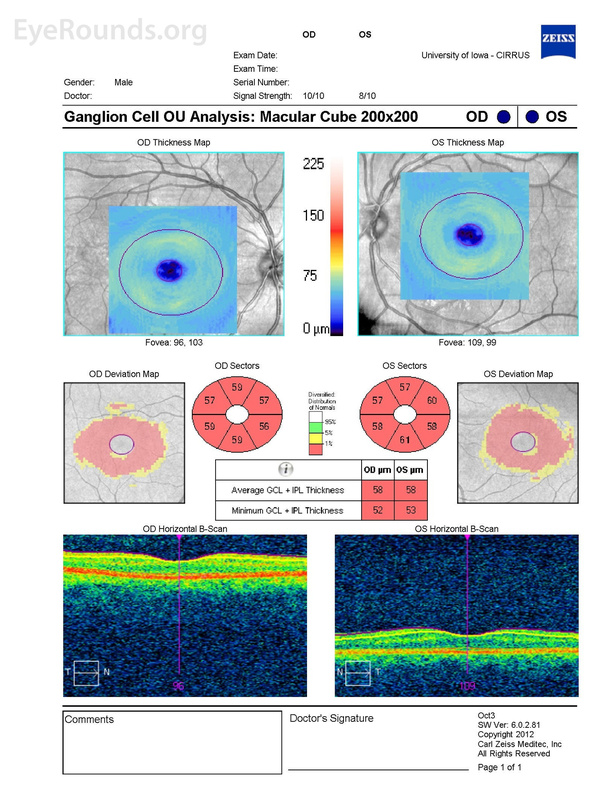 Optical Coherence Tomography (OCT) of the Macula. Diffuse thinning of ganglion cell layer OU. Figure 4. 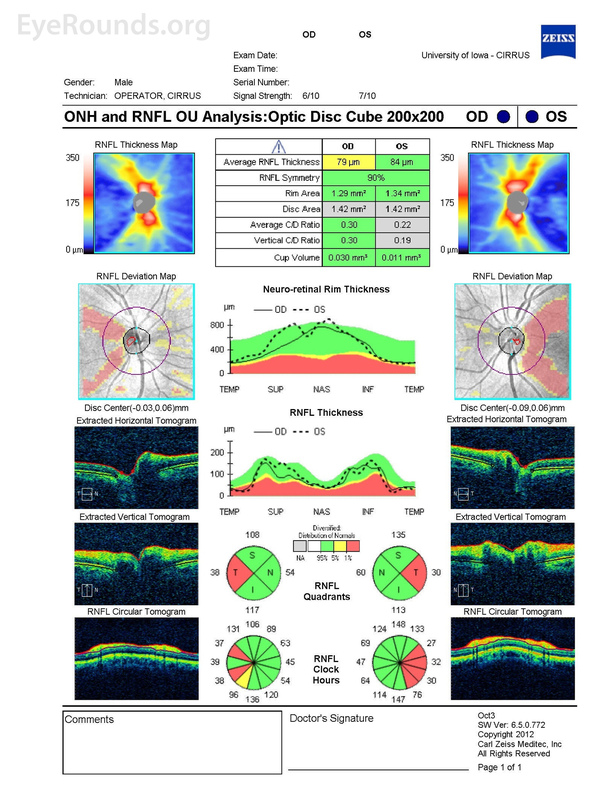 Optical Coherence Tomography (OCT) of the Optic Nerve Head. 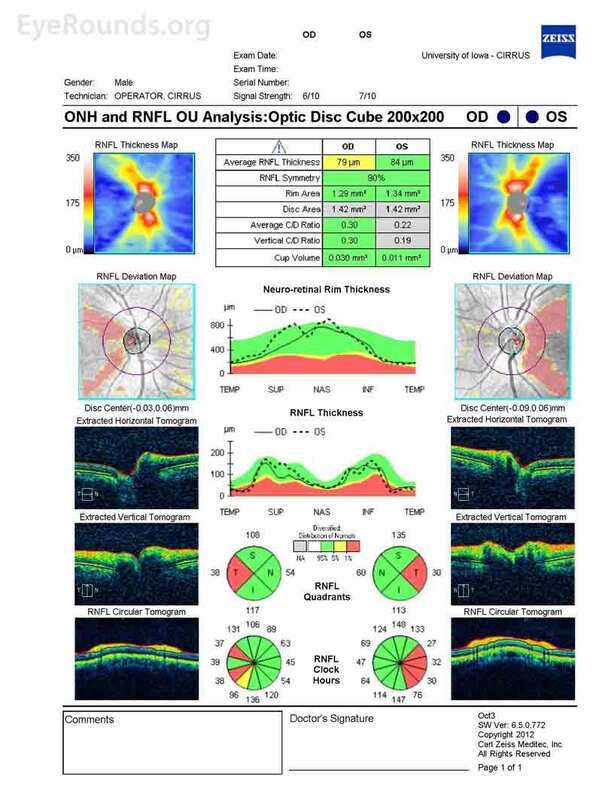 OD: Retinal nerve fiber layer (RNFL) thickness was 82 microns. There was RNFL thinning temporally, superiorly, and inferiorly; OS: RNFL thickness was 88 microns. There was RNFL thinning temporally, superiorly, and inferiorly. Table 1. Critical Flicker Fusion: Severely decreased OU. The patient was educated on the natural course of nutritional optic neuropathy. Given the OCT finding of ganglion cell loss and the temporal pallor of the optic nerves, significant recovery of vision was considered unlikely. He was continued on dietary and vitamin supplements, and he had annual eye examinations. His vision remained stable and he learned to adapt to his central scotomata. Nutritional optic neuropathy is characterized by bilateral, symmetric, cecocentral scotomas, an acquired disturbance of color vision (usually dulling of the color red), and either a normal fundus morphology or tortuosity of small retinal vessels within the nerve fiber layer. This condition causes a progressive, painless loss of vision that is usually severe and symmetric . 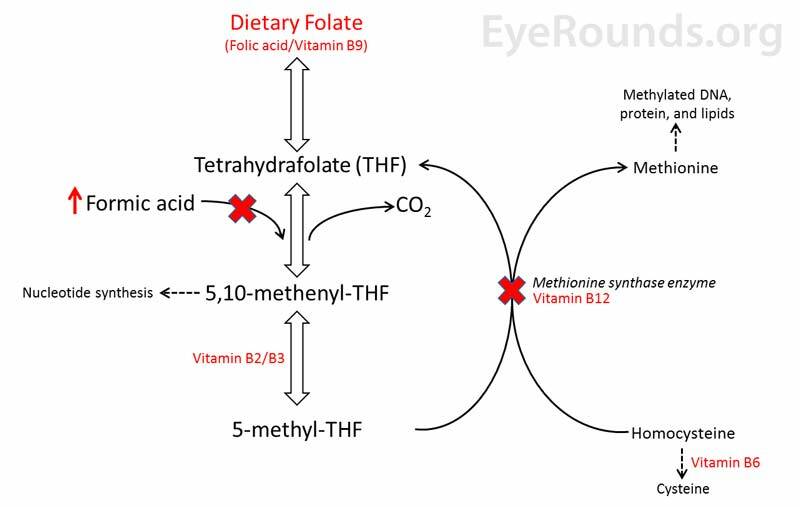 Deficiencies in the following vitamins are primarily responsible for the damage caused to the optic nerve: B1 (thiamine), B2 (riboflavin), B3 (niacin), B6 (pyridoxine), B9 (folic acid), and B12 (cobalamin), with B1, B9 and B12 playing major roles . These B complex vitamins are cofactors for many reactions in cellular metabolism and catabolism. Deficiencies of these vitamins lead to toxic byproduct accumulation within cells. Vitamin B9 and B12 are an essential part of a reaction that produces purines using formic acid as a reagent (Figure 5); thus, these vitamin deficiencies lead to the accumulation of formic acid, which inhibits the electron transport chain and depresses mitochondrial function (i.e., interferes with ATP production) . Depletion of ATP leads to nerve dysfunction and eventual nerve death, which accounts for the progressive, irreversible nature of this disease . In the developed world, alcohol abuse is a common cause of malnourishment. Severe alcoholics, like the patient presented in this case, get their caloric needs from alcohol, which is lacking in the vitamin B complex. Chronic alcohol abuse leads to systemic deficiencies in B1, B9, and B12, which then leads to nutritional optic neuropathy. Another factor that likely contributed to our patient's optic neuropathy is his history of smoking. Tobacco smoke can cause optic nerve damage, also called "tobacco optic neuropathy," through intrinsic toxicity and vasospastic effects. Tobacco contains small amounts of cyanide, which is thought to be the source of its neurotoxic properties. Cyanide inhibits the electron transport chain leading to disruption of ATP production in these sensitive nerve fibers . Tobacco can also be toxic by causing disturbances in the metabolism of the vitamin B complex and by impairing vitamin B12 absorption . Although the use of tobacco has increased since the early 19th century, there has been a drastic decrease in the incidence of tobacco optic neuropathy in the general population. It is speculated that this decrease is due to three reasons: 1) Early cases were probably misdiagnosed, 2) nutritional status of the general population has improved, which helps protect against the malnourishing effects of tobacco, and 3) cigarette smoke, the most common form of tobacco consumption currently, may not be as toxic to the optic nerve as historical methods of consumption (e.g., snuff and chew) . Although controversial, some researchers postulate that alcohol and tobacco act synergistically to cause optic nerve damage via a disease formerly referred to as "tobacco-alcohol amblyopia." The theoretical mechanism of this disease is based on the decreased consumption of vitamin B12 from alcohol abuse combined with the decreased absorption of vitamin B12 from tobacco use leading to severely low levels of this vitamin in the body. There is also evidence that the cyanide from tobacco smoke can accumulate more rapidly in patients who have alcohol induced hepatic dysfunction due to the fact that cyanide is primarily detoxified in the liver . Lastly, hydroxocobalamin (a derivative of vitamin B12) can convert cyanide to cyanocobalamin, which helps with the detoxification; therefore, deficiency of vitamin B12 may make patients more susceptible to effects of cyanide . Early intervention with dietary supplementation and cessation of alcohol/tobacco use can reverse some of the vision loss and prevent progression, but in the case of our patient, the optic nerve damage was permanent . Figure 5. Biochemical interaction between Folate (vitamin B9), vitamin B12 (cobalamin), and formic acid. A dietary deficiency of folate or B12 (red X's) will lead to the accumulation of formic acid and cause toxicity. Malnourishment from alcohol abuse and tobacco abuse leads to optic nerve damage. Both smoking and alcohol can cause B12 deficiencies. B12 and B9 deficiencies lead to increased formic acid production, which impairs the electron transport chain. This leads to ATP deficiency, thus causing optic nerve damage. Abuse of tobacco can lead to increased levels of cyanide in the body, which can impair the electron transport chain similarly to that of formic acid. Decreased bilateral visual acuity since the papillomacular bundle is preferentially affected. Severity of vision loss is variable. Visual fields demonstrate bilateral central or cecocentral scotomas. Pupils may react sluggishly, however there will be no RAPD if the field loss is symmetric. Optic discs may look normal initially or slight hyperemic. Over time, temporal pallor develops. The clinical appearance is similar to Leber hereditary optic neuropathy (LHON), which can also present with normal appearing nerves. Treatment consists of avoidance of the offending agent, in addition to vitamin supplementation, including thiamine, folic acid, and cyanocobalamin. From 1991-1993, approximately 50,000 Cubans were diagnosed with optic neuropathy; this came to be known as Cuban Epidemic Neuropathy. Researchers found an association between smoking and low serum levels of B vitamins. In these patients visual recovery was seen following injections of hydroxocobalamin every few weeks, possibly due to the conversion of free cyanide to cyanocobalamin. In addition, the Cuban government initiated oral supplementation with multivitamins in the general population leading to a substantial decrease in incidence in 1993. Treatment for nutritional optic neuropathy consists of sustained abstinence from alcohol and tobacco and a healthy balanced diet. Patients should initially be followed monthly with the interval extended as the vision stabilizes [7-9]. Sharma P, and Redea S. "Toxic Optic Neuropathy." Indian Journal of Ophthalmology 2011 Mar-Apr; 59(2): 137-141. Solberg Y, MD, PHD; Rosner M, MD, MSC; and Belkin M, MD, MA. "The Association Between Cigarette Smoking and Ocular Disease." Survey of Ophthalmology 1998;42(13): 535-547. Hvas AM and Nexo E. "Diagnosis and Treatment of Vitamin B12 Deficiency--an Update." Haematologica January 2006;91:1506-1512. Sadun AA, Martone JF, Muci-Mendoza R, et al. Epidemic optic neuropathy in Cuba. Eye findings. Arch Ophthalmol 1994;112(5):691–699. Epidemic Neuropathy—Cuba, 1991-1994. JAMA: The Journal of the American Medical Association. 1994;271(15):1154. doi:10.1001/jama.1994.03510390018010.